Now EWG VERIFIED, as in The Environmental Working Group's SkinDeep, Hyaluronic Serum provides three different weight molecules of hyaluronic acid to deliver hydration and support to all layers of the skin. It is vital to maintain proper hydration in all levels of the skin for optimal skin health. It plumps and smooths the skin; improving the look of fine lines, wrinkles and other surface imperfections. Hyaluronic acid is a natural component responsible for the moisture, firmness and suppleness of our skin. However, as we age, our bodies produce much less than what is needed to keep skin plump, hydrated and youthful. 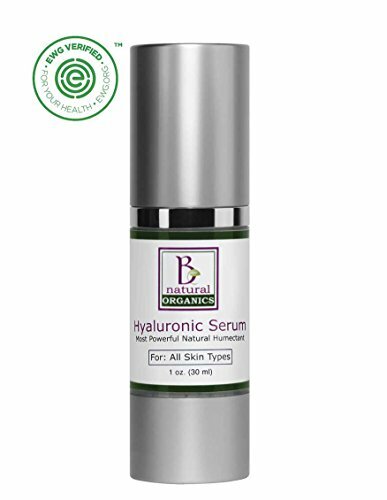 While most hyaluronic serums use only large molecules, Be Natural Organics' Hyaluronic Serum offers three molecular sizes of sodium hyaluronate to penetrate all layers of the skin for optimal results. Low Molecular Weight Hyaluronic Acid - This is the smallest size molecule and is able to penetrate into the deepest layers of the skin (the hypodermis) where most cellular repair takes place. It binds to water molecules, pushing them into the lower layers of skin to prevent dehydration there. This contributes to elastin production while stimulating the production of new collagen and supporting the collagen already present. Medium Molecular Weight Hyaluronic Acid - These medium-sized molecules bind more water than the low molecular weight molecules and are able to penetrate into the middle layers of the skin where cellular activity takes place. This size molecule is crucial for healing and repair functions of damaged skin. It also offers a more immediate visual effect on the complexion as it hydrates and softens wrinkles. High Molecular Weight Hyaluronic Acid - This is the largest size molecule which creates the most visible improvement in the skin with its ability to bind huge amounts of water like a "molecular scaffolding" able to fill voids and smooth out wrinkles and fine lines. Visit BeNaturalOrganics.com for more information. If you have any questions about this product by Be Natural Organics, contact us by completing and submitting the form below. If you are looking for a specif part number, please include it with your message.